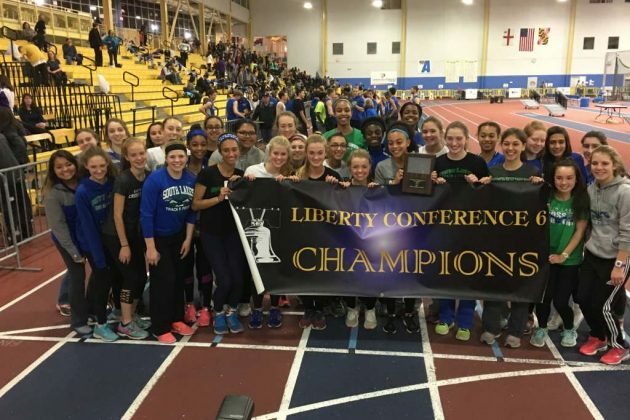 The South Lakes High School track teams are once again on the top of the heap in the Liberty Conference. 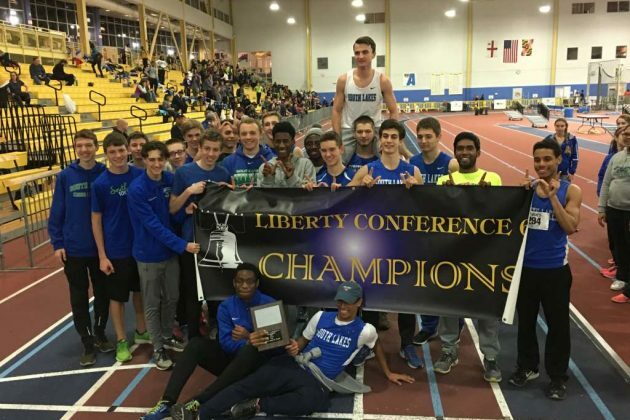 The boys closed out their ninth consecutive title this weekend at the championships in Landover, Maryland, while the girls took their sixth straight. Junior runner Olivia Beckner, who had already set multiple new records earlier this season, won both the 1,000 meters (2:55.67) and 1,600 meters (5:04.44) in meet-record times. She also won the 3,200 meters (10:47:17) in school and conference record time. Senior Devyn Jones won the 300 meters in 42.72 and finished third in the 500 meters (1:20.52) and fifth in the triple jump (33-08.75). She won the 55-meters hurdles in conference record time on the first day of the championships, as well as finishing second in the long jump and sixth in the high jump that day. Jones was part of a SLHS sweep of the 500 meters. The race was won by junior Aly Rayle (1:19.62), followed by freshman Mary Gregory’s second place finish of 1:19.69. Rayle and Gregory teamed with sophomores Sophie Halkett and Cara Hutson to win the 4-by-400 meter relay in 4:09.53. The Seahawks also won the top three spots in the 1,000 meters with Beckner leading the way, followed by Halkett (3:05.81) and sophomore Jordan Anderson (3:07.76). On the boys’ side, seniors Timiebi Ogobri and Don’ta Whitley had outstanding performances for the Seahawks. Ogobri, who successfully defended his 55-meters title on Day 1, won the 300 meters in 36.54. Sophomore Stevie Jones was third (37.19) and Whitley finished fifth (37.43). Ogobri was also fifth in the triple jump (39-04.00) and teamed with Jones, sophomore Nicky Napolitano and junior Carson Frutchey for third in 4-by-200 meter relay (1:35.34). Whitley was second in the triple jump (42-01.75), second in the 500 meters (1:08.61), sixth in the high jump (5-08.00), and teamed with senior Dimarcus Vilcheck and juniors John Eggeman and Houston Nelson for third in the 4-by-400 meter relay (3:38.21). Senior Peter Sepulveda was third in the 1,600 meters (4:36.57), followed by juniors Alex Loukili (4:37.35, 4th) and Sean Casey (4:38.76, 5th). Loukili ran a 2:40.55 for third in the 1,000 meters while Casey finished fifth with a 2:46.85. South Lakes will next compete in the 6A North Region Indoor Championship on Wednesday, Feb. 15 at the Prince George’s Sports and Learning Complex in Landover.